As part of a series that I am writing about starting a medical practice, one of the essential components to starting a medical practice is to have a Medical Malpractice Insurance Company. There are several to choose from. I chose to use CAP - Cooperative of American Physicians. It is a company run by physicians. I also spend some time promoting CAP to my fellow doctors. I am reimbursed for my time spent working with CAP. My wife, Dr. Tammy Wu, Modesto Plastic Surgeon is on the board of directors. I have been very happy with getting malpractice coverage from CAP. There are other insurances you will need such as general liability coverage for your medical company (I'll cover more of this at a later time). This webpage is a personal webpage of Dr. Calvin Lee's. This does not represent the viewpoints of CAP or MPT (Mutual Protection Trust). If you are in California, consider calling CAP regarding an malpractice coverage quote for your malpractice coverage needs. Nearly 11,000 covered members as of February 2010 and growing. 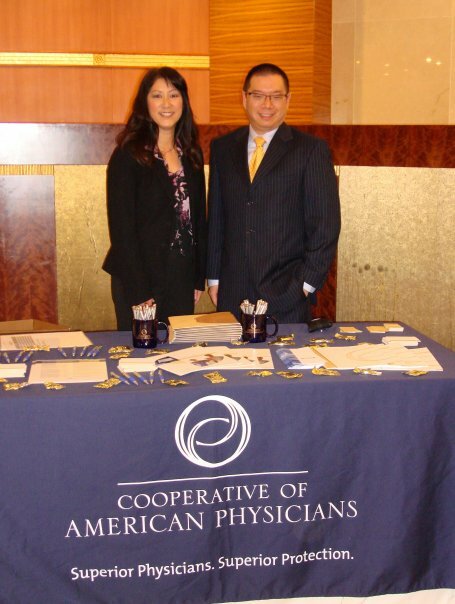 Northern California Taiwanese Physicians Medical Association Event. Mutual Protection Trust is rated A+ (Superior) by A.M. Best Co. I have not explored these insurance companies in much detail. I am personally covered by CAP-MPT. They would deserve attention on this website which introduces links to the California Malpractice Insurance world. Malpractice Insurance is now most often referred to as Professional Medical Liability insurance. Listed here are links to these California Malpractice Insurance companies and their descriptions offered on their web pages. Norcal - NORCAL is on the cutting edge of advancements in medicine & medical liability protection, and they offer an array of coverages tailored to your doctors' specific practice needs. The Doctors Company - Physician-owned professional liability insurer offering online info regarding medical malpractice insurance, risk management, & medical liability legislation. MIEC - Paraphrased from their website: We are MIEC, an insurance company that provides medical professional liability insurance to physicians in Alaska, California, Hawaii and Idaho and to acupuncturists in California & Hawaii. We are owned and operated by our policyholders. We were founded in 1975 by physicians during a time when commercial insurance carriers withdrew from the market. Now, some 30 years later, we remain determined to provide our policyholders with low, responsible and stable insurance premiums. I am probably missing some malpractice companies in California. Feel free to send me email - I have an email reply box at the bottom of our web page: Modesto Botox - click on the contact us link. Free computer programs for plastic surgeons. I have to post some more here. I have written some of the software that we use in our office, but it is a little bit awkward to use (just ask my staff - sorry guys!). Computers in our plastic surgery office - what computers did we get in 2006 to help run our plastic surgery office and reviews.